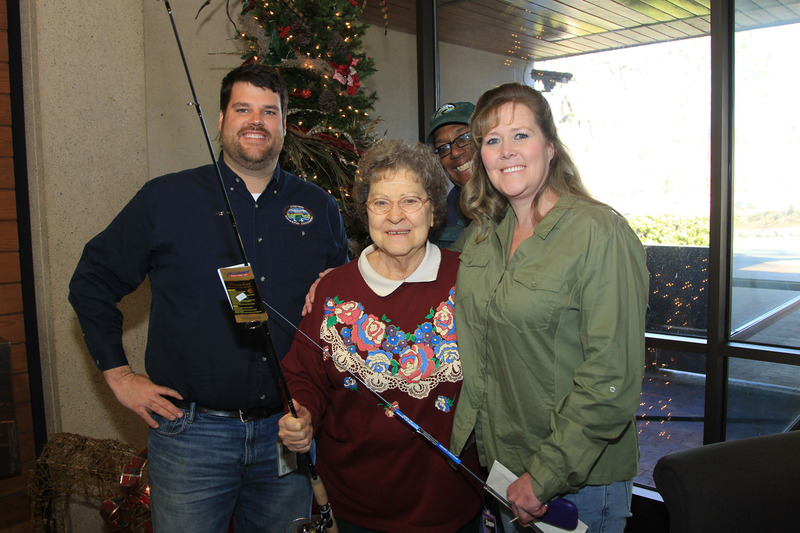 83-year old Rossine Jones of Jacksonville won the AGFC’s Family and Community Fishing Program trout tagging contest in December 2012. For 83-year-old Rossine Jones of Jacksonville, this Christmas has been a special one for the avid angler. Jones won the Arkansas Game and Fish Commission’s grand prize in the agency’s Family and Community Fishing Program trout tagging. Jones caught a tagged trout at the Sherwood Community Pond on Dec. 1 as she fished with her granddaughter Denise Thomson. Jones’ name was drawn from anglers who turned in a tag from the AGFC’s special trout tagging program. In November 2012, the AGFC stocked thousands of rainbow trout around the state. Out of that total, just over 100 trout were tagged with a special telephone number to call if caught. Jones’ grand prize package included a two-night cabin stay at the Red River Trout Dock in Heber Springs, a half-day guide trip along with two fishing poles and fishing gear. The cabin and guide were donated by Red River Trout Dock and the fishing equipment was donated by the Arkansas Game and Fish Foundation. Second place went to Keith Malvin of Little Rock. Malvin won a fishing pole and fishing gear. Third place went to Wesley Moot of Cabot. His prize was a fishing pole. Both the second and third place prizes were donated by the AGFC. For more information on the Family and Community Fishing Program and its stocking program, visit www.agfc.com or call the stocking hotline at 866-540-3474.